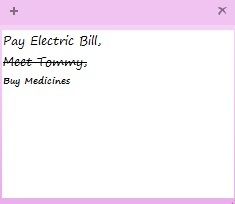 Sticky notes is one of the favorite desktop gadget for most of us ,that organize our tasks simply , for both office and personal works. Select the words you want to strike out. Now press the shortcut key , Ctrl + t. Note that strike lines will not appear for smaller font size. Increase font size and try again. By default, the font size of the sticky note is bit larger and there is no direct option provided to reduce the font size in Windows 7 and Windows 8. This simple shortcut trick will allow you to increase or decrease the font size of sticky notes in Windows. Now select the text that you want to reduce the font size. Press Ctrl+ Shift + < . Now you can see the font size is reduced one step smaller. If you want to reduce further, press Ctrl + Shift + < Again. If you want to increase the font size, you can use shortcut Ctrl + Shift + >, by selecting the desired text. This trick will work in Windows 7 and Windows 8 as well.